Get the Online Social Media Training Mayo Clinic Uses! 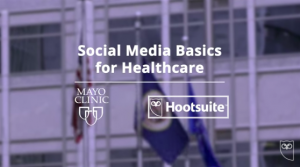 For the last three years, the Social for Healthcare Certificate from Mayo Clinic and Hootsuite has been our front-line social media training resource for Mayo Clinic staff. Now we can offer that same unlimited access to employees of organization members of the Mayo Clinic Social Media Network (MCSMN). Our Mayo Clinic staff depend upon this online training to help them learn to use social media tools safely and effectively in their health care context. Seat licenses for this training for those outside of Mayo Clinic were previously limited, but now we can offer unlimited access among the benefits of organization membership in MCSMN. Even if you have busy staff members or physicians who are interested in only one or two of the modules, that’s OK. With unlimited access, you won't need to conserve seat licenses. So if you have a physician who wants to create a personal Twitter account, for example, you might suggest the Twitter Basics and Professionalism modules, which take only 20-25 minutes each. It’s a great way to get your staff up to speed quickly so they can safely and confidently engage in social media platforms that interest them. We believe this makes organization membership in MCSMN an extremely attractive value. To learn more about membership benefits, contact Dan Hinmon, our community director. We hope you'll take advantage of this affordable opportunity to effectively manage your stakeholders' social media interest and involvement.